This is another article about submarines. This time, I depict all The submarines of the European Union in 2018, in a single image! After the recent graphics, where all the submarine classes of China, United States of America and Russia are illustrated in single images, I thought it was a good idea to present the whole (honestly impressive) undersea fleet of the European Union. Note though that the military forces of European Union are not integrated and thus there is not a single European Navy from the members of the European Union. However, in March 2017, the European Union approved a new military command center for foreign training missions after Britain dropped its opposition (which was the main obstacle), the latest step in EU efforts to integrate its military forces and defense industries.Therefore, the formation of a "EU Navy" is closer than ever. 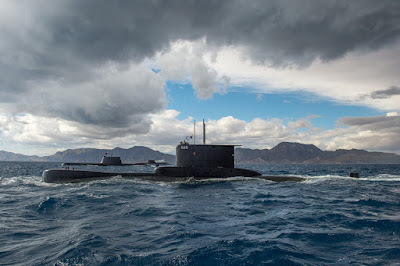 The EU submarine fleet consists of 65 boats of which eight (8) are nuclear-powered ballistic missile submarines (SSBN), 13 nuclear-powered attack submarines, 44 diesel-electric submarines (SSK) of which SSK the 22 are equipped with air-independent propulsion system (AIP). There 21 classes in commission (some of them are actually are variants of basic submarine types such as Type 214 and Type 212). Only two countries, United Kingdom (UK) and France operate nuclear-powered submarines while there are five countries that operate submarines equipped with Air-Independent Propulsion (AIP). The UK has by far the largest submarines among all the European countries with its Vanguard class SSBN being 150 meters in length and displacing less than 16,000 tons. Romania actually has no submarine as its sole submarine, Delfinul, has been inactive since 1995. The two countries with the most numerous submarine fleets in their Navy, are the UK and Greece (each has 11 boats in commission) however the former has all its submarines nuclear-powered. The UK will leave the EU on March 29, 2019. 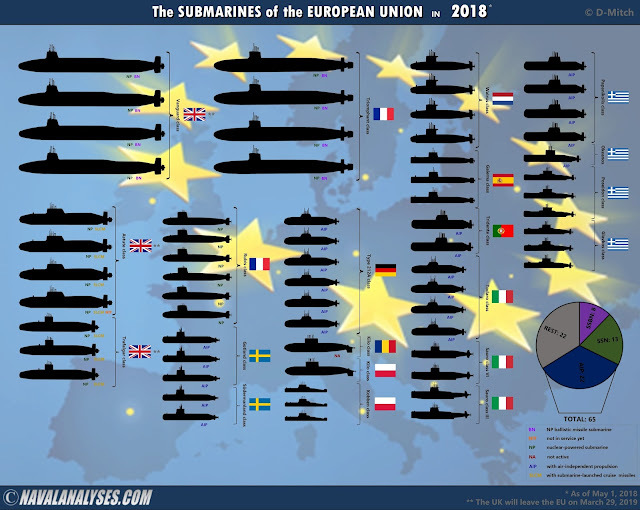 The submarines of the European Union in 2018. For a high resolution image click here.